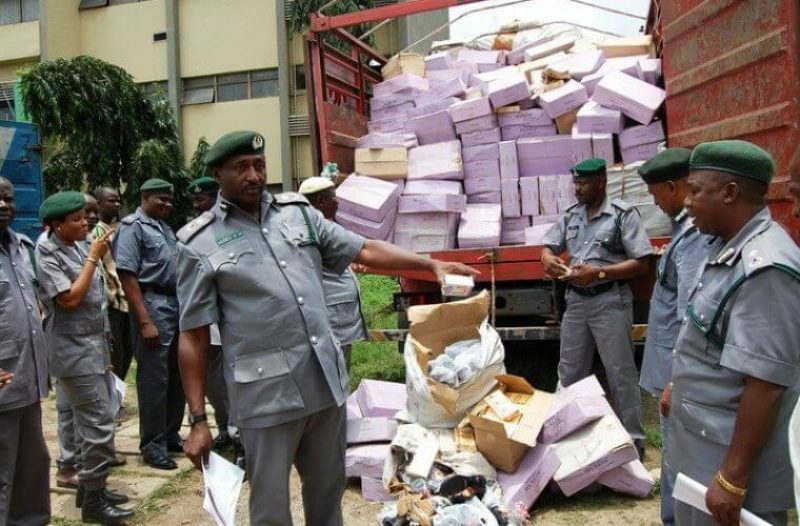 The Federal Operations Unit, Zone A of the Nigerian Customs Service has seized about 1.1bn truckload of codeine cough syrup in Lagos. The NCS said its officers impounded a MAN diesel truck with registration number XB 286 BEN along Afromedia Estate by Egbeda Junction beside Alaba International, carrying 2,748 cartons of DSP Codeine Cough Syrup 100mg (100 per carton) and 95 cartons of Chaka pain Xtra approximately worth N1,175,200,000.00. The controller of the Unit, Mohammed Uba revealed this while addressing the journalist in Lagos on Wednesday. According to Uba, “The driver of the truck on sighting our officers abandoned the truck and fled. Also, 49 cartons of tramadol capsules (100mg) were evacuated from the warehouse in Ajao Estate based on the information. The drugs will be handed over to NAFDAC for further investigation. “Similarly and more remarkably among the seizure was the evacuation, by the Warehouse Operations team led by AC Mutalib Sule, of 21 sacks of pangolin scales weighing 1,031kg and 4 pieces of elephant tusk weighing 29.35kg from a shop located in Tejuosho market in Victoria Island based on the information. “The occupant of the shop fled and still is at large, but the investigation is already ongoing towards getting the culprit arrested and prosecuted. “The seized endangered species have a DPV of N253,566,056.7. You will recall that the Minister of State for Environment, Mallam Usman Jibril accompanied by the CITES Delegates from UN visited the Unit, inspected the previous seizure of such endangered species this year and even commended us for a job well done. “The trade on such endangered species is globally prohibited, hence the need for us all to fight against such illegality so that such endangered species do not go into extinction. “Also within the weeks under review, the unit intercepted a Ford Transit Bus with engine no. XL32452L along Olorunda axis, Idiroko, Ogun State conveying 39 sacks and 1,220 parcels of Cannabis Sativa popularly known as Indian Hemp weighing 1, 610 kg concealed with baskets of Fresh Tomatoes, pepper and vegetables. “In the spirit of interagency relationship, the seized substance will be handed over to NDLEA for further investigation. Other seized items include 17 units of exotic vehicles, 1,380 bags of foreign parboiled rice, 1, 126 pieces of used shoes, and 140 jerrycans of vegetable oil. “Among the detained vehicles include 7 Toyota Land Cruiser Jeeps (2015-2018), 4 Toyota Hiace Bus (2017), 2 Toyota Coaster Bus (2017), and 4 Toyota Camry (2014). “These 17 Exotic Vehicles have a duty paid value of N384,291,251.94 only. While 4 of the vehicles were intercepted along Ijebu Ode expressway, 13 were evacuated from House Plot 1, Akintailor Close, Allen Avenue, Ikeja, based on credible information. 8 Suspects were arrested in connection with these 25 seizures “As partners in progress, let me thank you, members, of the media for your continued support in your reportage of our anti-smuggling drives.